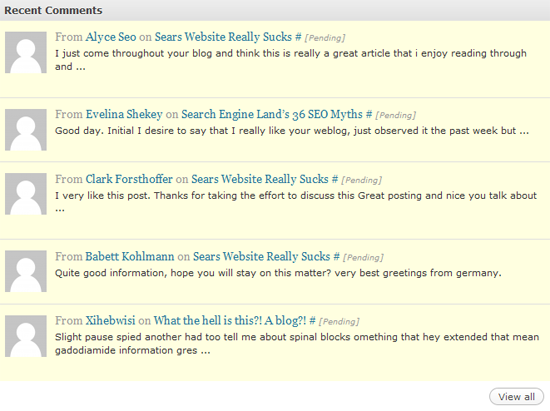 As my “stable” of personal blogs and niche websites grows I get more and more crap comments. I’ve put Hashcash in place as well as Cookies for Comments yet these clever programs persist to build programs that automatically submit all sorts of generalized, worthless crappity crap to my sites. Often they’re linking to something like “designer-handbags-4-mothers-and-daughters-who-like-london-shopping.blogspot.com” or some ridiculous Russian domain name. The people who use these automation tools don’t bother to even glance at your site, so the outsome is always something about how they sincerely love the site and bookmarked it to tell their friends. These tools must be getting more popular, because the frequency at which this horde of trash comes at a Website seems to be increasing. I would suggest instead of using these automated tools to put a little custom work into it and actually write comments on posts you like. There are tools for this as well that are far less spammy and would probably achieve the goal of posting actual thoughtful comments on interesting relevant posts. It’s well worth considering. One piece of software that can help you do this more legitimately is Fast Blog Finder. It has a Free and a Paid version so you should try it out. It helps automated a lot of the hunting of legitimate, active blogs. I’ve used it a little and actually made some good contacts with it on blogs I wouldn’t have otherwise found. A few I even subscribe to now because it does a pretty good job at finding relevant blogs and content to whatever you’re looking for, helping to build my online social network. And this tool isn’t for spamming – it doesn’t automatically submit comments, it’s to help you find relevant active blogs to read posts and comment on. And I’ll guarantee you’ll have more success and you’ll feel better about your work when you actually participate in discussion. Just try the free version and see if it helps save you time. I now expect that this post gets spammed with another flow of crap from auto-submitters. Some of them are rather amusing actually in their naive, generalized irrelevance. I think for fun I’ll remove the links and approve some of the better ones to this post for your amusement.